Earn up to KV Bucks with purchase. 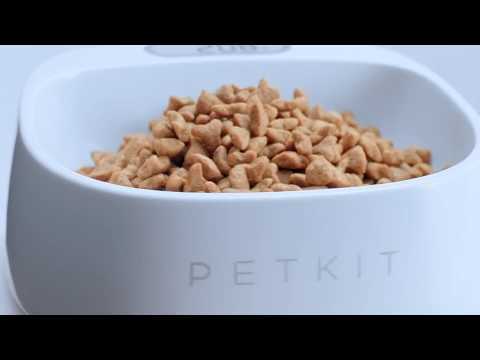 The PETKIT FRESH Smart Digital Pet Bowl features a built-in digital scale that allows you to precisely control the amount of dry food for your pet. This completely waterproof pet food bowl is ergonomically contoured for your dog’s comfort, preventing less reach over and stress on the neck. The PETKIT FRESH Smart Digital Pet Bowl provides an accurate way to calculate your pet’s food intake, by measuring the weight, in both Pounds and Kilograms. Combined with the FREE PETKIT app (available for IOS and Android devices) and the basic information you provide – weight, breed, age, food – you’ll receive unique suggestions that are calculated based on the pet’s profile. More than just an elegantly designed bowl, the outer shell features advanced anti-bacteria technology – BioCleanAct™, an organically sourced anti-microbial material that can help inhibit a large majority of bad bacteria and germs, such as E-coli, from forming. Available in multiple patterns and colors the PETKIT FRESH Smart Digital Pet Bowl has a 450ml feeding capacity and is recommended for Small breed dogs. For Medium to Large breeds, see the PETKIT FRESH METAL Smart Digital Pet Bowl.